A Jeep in Florida went up in flames after the Samsung Galaxy Note 7 smartphone was left charging in the car. Airlines have warned passengers not to bring the device on planes, and the U.S. issued a dire warning to Samsung customers to power down the phones "as soon as possible." 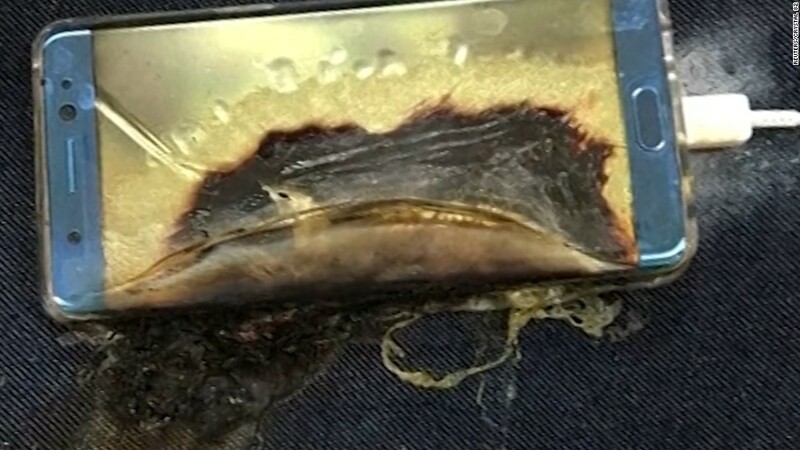 Samsung (SSNLF) has endured a string of brutal headlines since it first issued a massive global recall of the Galaxy Note 7, citing "battery cell issues" that can cause the device to catch fire -- and possibly explode. While the recall may damage Samsung's reputation and has already hurt its stock, the company isn't the first to be upended by its batteries -- and it probably won't be the last. Just this year, HP (HPQ) and Sony (SNE) have recalled computer batteries for fire hazards, and about 500,000 hoverboards were recalled due to a risk of "catching fire and/or exploding," according to the U.S. Consumer Product Safety Commission. What these products all have in common: lithium-ion batteries. Since their introduction in the early 1990s, lithium-ion batteries have become the gold standard for consumer electronics devices, including smartphones, smartwatches, laptops and cameras. This is the technology that lets companies squeeze hours of battery life into increasingly slim devices, but it comes with a greater risk of catching fire or exploding in the event of a manufacturing defect. "This is a well-known problem. When this goes bad, it goes catastrophically bad in a very high-profile way," said Jay Whitacre, a professor at Carnegie Mellon's Department of Materials Science and Engineering. Case in point: all 50 of Boeing's 787 Dreamliner aircrafts were grounded in 2013 due to concerns about, you guessed it, lithium-ion batteries catching fire. The problem, according to Whitacre, is that lithium-ion batteries on the market right now rely on "solvent-based electrolytes" to pack in more energy, but these electrolytes are flammable. And when something goes wrong, all that energy passing through the battery can boil the electrolytes and cause a fire. The risk is extremely rare, with some estimating the normal failure rate to be one in ten million batteries. But when there is an error in the battery manufacturing process like Samsung says it experienced, the odds of failure can increase significantly. Samsung said it has received reports of at least 35 batteries catching fire or exploding out of the 2.5 million Galaxy Note 7 devices shipped. It's a tradeoff, plain and simple. "The convenience of them is so great that as a society we take on this risk," Whitacre says. "It's not necessarily comforting, but it's fact." Everywhere you look, you'll find these batteries. Samsung's chief smartphone rival, Apple (AAPL), uses lithium-ion batteries in its iPhones, iPads and MacBooks, according to its website. It's how Apple can squeeze enough battery into a tiny device like the Apple Watch. "Compared with traditional battery technology, lithium-ion batteries charge faster, last longer, and have a higher power density for more battery life in a lighter package," Apple says on its website. Tesla (TSLA) also uses lithium-ion batteries in its electric cars, but relies on a cooling system to keep them from overheating. Businesses and researchers continue to look into new battery technologies, but these lithium-ion batteries remain the standard. "There is not, at this time, an alternative to lithium-ion," says Steve Levine, author of The Powerhouse: Inside the Invention of a Battery to Save the World. "It's very hard to meet all of the required metrics," Levine says, "meaning that they last a long time, they undergo punishment, they can be charged and recharged many, many times, and they are relatively safe."